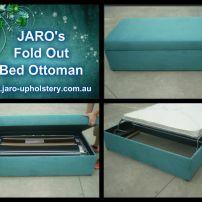 commented on "JARO'S Fold Out Bed Sofa's, Ottomans & Window seating available in Melbourne"
We can custom make a variety of fold out bed options. Speak with us about your requirements. This ottoman is fitted with a double bed and the lid can be used for a small child's bed.